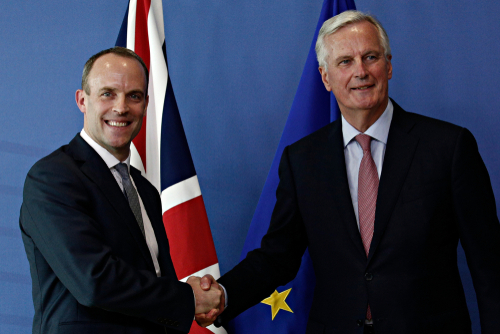 12 Sep 2018, 1:02 p.m.
Dominic Raab, the UK's new Brexit minister, meeting with EU negotiator Michel Barnier last month. The price of silver hit a two and a half year low this week after market pressures and increased value for both the Pound and the Dollar weighed down on the price per ounce of the precious metal. Silver currently sits at £10.85 per ounce – the lowest price since April 2016 – with gold prices also dropping in response to the stronger currencies. The big shift in price came from the investor responses to comments made by Michel Barnier, the EU’s Chief Brexit Negotiator. Mr Barnier told reporters and guests at a conference in Bled, Slovenia that he could see the first major Brexit treaty signed by November. “I think that if we are realistic we are able to reach an agreement on the first stage of the negotiation, which is the Brexit treaty, within 6 or 8 weeks” said Barnier. This is a far cry from the reports of disastrous negotiations earlier in the year, and the response was for the Pound Sterling to gain over 1% against the US Dollar as investor confidence returned to the UK currency. This in turn pushed commodity prices down in response to its increasing strength, giving consumers greater purchasing power. Industrial usage of silver has risen annually and consistently for the past five years, but investment demand has come down from the peaks seen in 2011. The bear market is one of the longest silver has experienced, and the gold to silver ratio (how much silver buys an ounce of gold) is at record levels. Silver's weak price means the ratio is a 10-year high of 84.52; just shy of the record at 85.20. Investors want the best deal possible, so any further drop in price could trigger a rush of demand to take advantage of silver. The Dollar has made modest gains in the past week too, with another US interest rate rise forecast and continued tensions between the US and China over trade, with global repercussions. View the BBP price charts for more detailed information about Silver prices for the past three years.